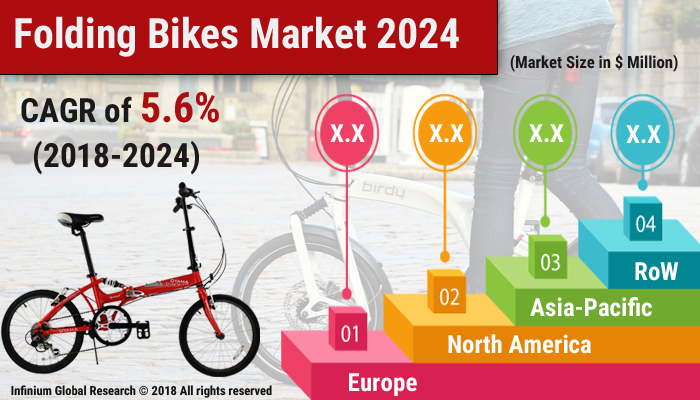 A recent report published by Infinium Global Research on folding bikes market provides in-depth analysis of segments and sub-segments in global as well as regional folding bikes market. The study also highlights the impact of drivers, restraints and macro indicators on the global and regional folding bikes market over the short term as well as long term. The report is a comprehensive presentation of trends, forecast and dollar values of global folding bikes market. According to the report the global folding bikes market is projected to grow at a CAGR of 5.6% over the forecast period of 2018-2024. A folding bike is a bicycle designed to fold into a compact form for proper transportation and storage. The first advantage offered by folding bicycles is intermodality. Unlike conventional bicycles, folding can be combined much more easily with other means of transport. Currently, few cities already have adequate infrastructure to transport the bicycle on public transport. Folding bikes have small wheels, low frame, and adjustable handlebars. Most models are designed primarily for urban use. Also, these folding bikes can be conveniently transported through passenger car vehicles. Increasing awareness about health and growing concerns about global pollution is the key factor driving the growth of the market. Moreover, the folding bikes can be taken anywhere as they are light in weight and the folding nature of these bikes helps to lower the space of the bikes while traveling to the farther places as the space needed to carry is very less. They can be taken to the hilly regions for those of the riders who have the hobby of hiking and trailing. Folding Bikes are increasingly viewed as an exercise tool all across the global, distinguishing its use even by wealthy consumers. In addition, folding bikes are gaining popularity among the people who are shifting towards healthy and eco-friendly solutions. Moreover, challenges associated with design safety and performance limitation are likely to restrain the growth of the folding bike's market. Furthermore, government encouragement for the use of bicycles as a mode of daily travel is providing several growth opportunities for the folding bike market. On the other hand, the increasing trend of the mixed mode of commutation among the urban commuters will influence the folding bike's market positively over the upcoming years. The report on global folding bikes market covers segments such as product type, frame material, and application. On the basis of product type the global folding bikes market is categorized into mid-fold, vertical fold, triangle hinge, magnet folding, and suspension system. On the basis of frame material the global folding bikes market is categorized into aluminum, steel, carbon fiber and titanium. On the basis of application the global folding bikes market is categorized into fitness, commercial, and sports. The U.S. drives the growth in the North America region as it is the largest market in the region. The Asia-pacific region offers substantial potential for the market growth owing to rapid growth in markets such as India and China. The APAC region is projected to experience growth at a CAGR of x.x% over the period of 2016-2024. The report provides profiles of the companies in the global folding bikes market such as Mobility Holdings, Ltd., Montague Corporation, Hummingbird Bike Company, Ltd., Dawes Cycles Limited, Decathlon S.A., DAHON North America, Inc., Cyclecentric Ltd., Citizen Bike Inc., Bobbin Bicycles Ltd., and Brompton Bicycle Ltd.. The report provides deep insights on demand forecasts, market trends, and micro and macro indicators. In addition, this report provides insights into the factors that are driving and restraining the global folding bikes market. Moreover, IGR-Growth Matrix analysis given in the report brings insight into the investment areas that existing or new market players can consider. The report provides insights into the market using analytical tools such as Porter's five forces analysis and DRO analysis of folding bikes market. Moreover, the study highlights current market trends and provides forecast from 2018-2024. We also have highlighted future trends in the folding bike's market that will impact the demand during the forecast period. Moreover, the competitive analysis given in each regional market brings insight into the market share of the leading players. This report will help manufacturers, suppliers, and distributors of the folding bike's market to understand the present and future trends in this market and formulate their strategies accordingly.